Normally, you’d get yourself in trouble if you broke an egg on a stranger’s trousers. But such behaviour is fine when one is performing live street literature. Then it’s just part of the act. I learned this interesting lesson on Saturday. 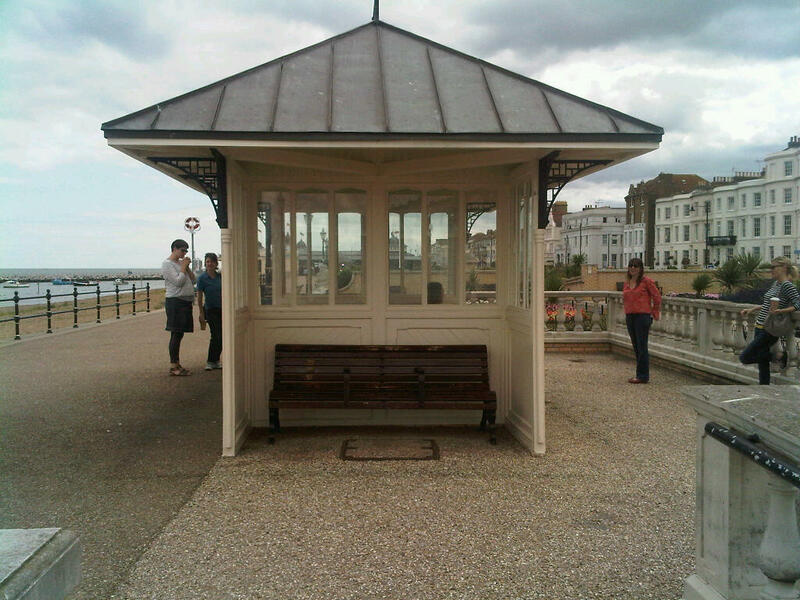 I was on the promenade of Herne Bay, an English seaside town, “performing” – and I use the term loosely – my short story Egg-box Eyeballs as part of the rather excellent Herne Bay Festival. The action concluded with me smashing an egg on the floor in dramatic fashion. In my one rehearsal I used a tennis ball rather than an egg, so as not to make a mess in the church hall where the piece was conceived. Doing it for real on Saturday, I was surprised at how far an egg will splatter if you chuck it on hard ground. You can see just how surprised in the short film of the event below. 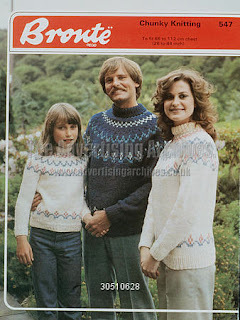 Fortunately, my audience/victims took it all in good spirit. How did I get myself in this situation? A lovely group of creative people called the Reauthoring Project told me they were looking for five writers to present work at the festival. Would I like to be one of them? they asked. Yes, please, I said. Their challenge was a simple one: each of the five writers had to take an existing piece of their work and find a way of presenting it to the public in a way that didn’t involve the traditional author reading. Our stage would be a beachfront shelter; our audience would be whoever happened to be passing. The five writers produced a fascinating mix of work. Apart from me barking away and chucking eggs about, there was interactive poetry, two sound installations and a “found” story experience on the beach. The people of Herne Bay were open minded about it all and showed a remarkable willingness to watch, listen and take part. I hope they enjoyed it. I know I did. Exciting? Yes. Raw? Totally, especially the eggs. I learned a great deal about how to engage an audience and I realised the folly of thinking that I can control how people experience a story. I also challenged a lot of my stereotypical assumptions about the kind of people who might enjoy my writing. We went to the pub afterwards to consider how we might do this kind of thing again. All very exciting. It’s good to step outside of one’s comfort zone occasionally, and I will be a very great distance away from mine next week. 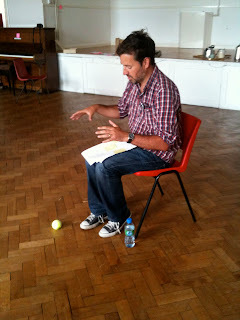 I’m “performing” a short story at the Herne Bay Festival. That is not the scary bit. I have done a few readings before and enjoyed the experience. 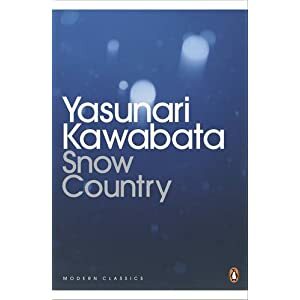 But in the past I was mainly talking to an audience of arty writerly types: they knew what to expect from me; I knew what to expect from them. It will all be very different in Herne Bay. I’m working with what is euphemistically called a “found audience”; I’m doing my stuff on the pavement, for however many passers-by I can persuade to listen. They might enjoy it. They might stand and jeer. There might be no audience at all. I’m working with a group of brilliant local writers as part of the Reauthoring Project. If you’re in the neighbourhood, come and check me out. I need all the support I can get. I’m doing my thing on Saturday August 27 at 12pm, 2pm and 3.30pm. And here’s me checking out the “venue”: a wooden shelter on the seafront at Herne Bay. An interesting new writerly experience for me last week. I was lucky enough to have one of my stories selected for a public reading by the lovely people at White Rabbit a while ago, and on Wednesday I went along to a pub in Ashford to see it performed. I’ve read my own stories to an audience before, but I’ve never seen one of them read by someone else. Gareth Brierley did a brilliant job. It can’t have been easy for him; unlike most of the other stories featured in the evening, mine contained no humour at all and didn’t really tell a story. It was more of an atmosphere piece, really. That’s not the kind of thing I usually write. In fact, if someone tells me a story of theirs is “more of an atmosphere piece, really”, I tend to interpret that as an admission of failure. But I won’t anymore! Like I say, Gareth did a great job. And I had a good chat with him afterwards to get some tips on public reading. Video of the performance exists somewhere, I’m told, but I don’t have any yet. Interestingly (for me, anyway) I wrote the first draft of the piece – “One of us is a ghost” – in the room where it was eventually performed, and then developed and edited it in the knowledge that, if it were accepted for performance, I wouldn’t be reading it out myself. That seemed to change my writing style in interesting (for me, at least) ways that merit some reflection. But not now. I bought myself an iPad last week – or rather, it finally arrived last week – so that I had another way of writing when out and about. I’ve since been reflecting on the “cool” new ways of working that this impressive piece of technology is urging me to adopt: electronic diaries for every area of my life, synched across all my devices; details of every project at my fingertips, wherever I happen to be; ways of generating ideas, planning stories and creating, all achieved without paper and pen. The iPad certainly gives me more efficient ways of achieving work tasks, but I don’t think those digitised ways of working are necessarily any more effective – not for me, at least. And its ability to automate certain activities does seem to strip out a lot of simple, everyday creative thought and reflection. If I write a to do list on paper, I have to think about it: how should I use my time, what are my real priorities, how do I balance my goals with the expectations of others? The act of writing the list is a moment for reflection. But if the computer generates the list for me, I just perform the tasks it offers. 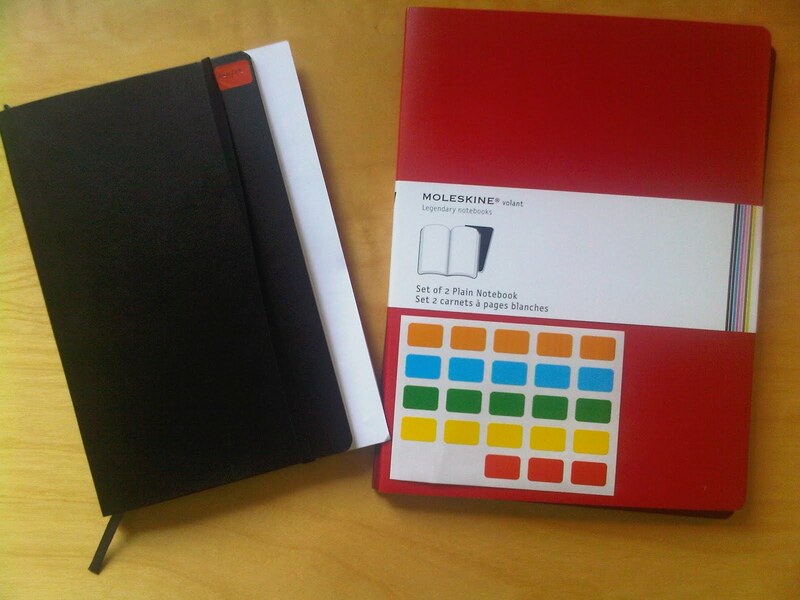 The iPad has been a surprisingly good writing tool, but yesterday I went out and bought a new paper diary, some sticky labels, glue and coloured pens. Sometimes analogue is better. I just updated my membership of 26, the brilliant community of creative business writers. As part of the process, I had to nominate my favourite word. I don’t really have one of those. Or if I do, it would probably take days of ruminations to decide what it might be. So, in a hurry, I opted for Cummerbund. This was a surprising choice. 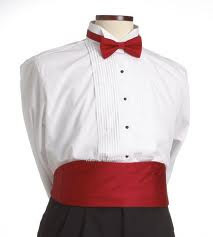 I very rarely attend black tie events, and when I do, I always decline the opportunity of renting a cummerbund. I actively dislike them. And yet, I like the word. It has a pleasant sound; strong vowels; resonant consonants. Say it slowly, and there’s even a bit of an eastern mystical mantra going on – the Ummmm followed by the Unnnn. 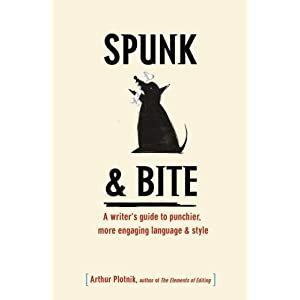 Pleasingly – and another surprise – this connects with the roots of the word. Cummerbund, I discover, is from the Hindi word kamarband. “Kamar” means waist or loin; band is from “bandhah” – a fetter or something that ties. This interests me. I’d have thought that a cummerbund, back in the 1600s, when the word was first recorded, had little practical purpose – it was just a clothing accessory. But that would be wrong. It’s original use, based on the etymology, was to strap a flabby stomach in place – which is mostly its purpose today, of course. Walking along the south bank of the Thames today, I came across a wonderful poetry installation. Called the Lion and the Unicorn, it’s part of the Festival of Britain anniversary celebrations. Hope the images from my Blackberry are legible. 1/ The best version of my story remains the QuickTime movie, and that just took an hour to make. But I can’t work out how to get it online, and even when I emailed it to someone the sound failed. 2/ The technology was a nightmare, but the creative side of mixing words and pictures was fun and rewarding. I will try again. 3/ The workshop was great. If you live in my part of the world, and get a chance to attend anything that the Live Lit people do, I’d recommend it. Must go and earn some money now…. I did my reading at the wonderful Komedia Theatre in Brighton this week, for Story Studio. What an amazing experience! 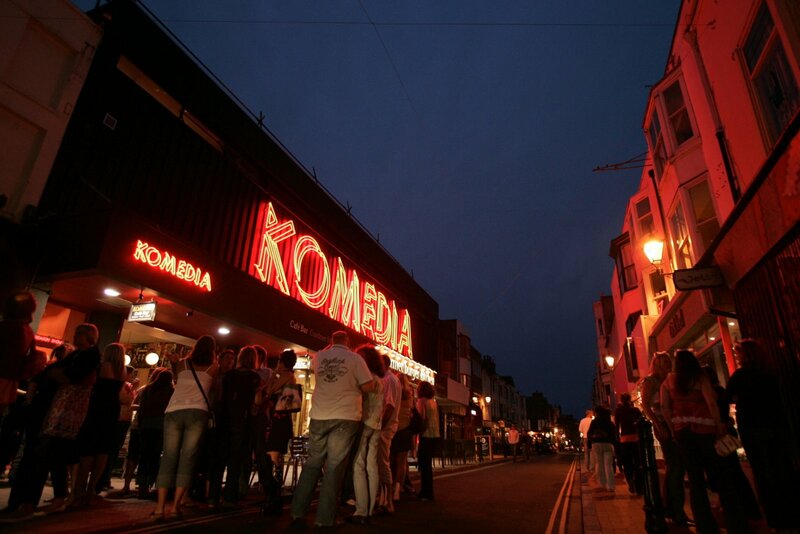 The venue was much bigger than I expected, and had sold out – they were actually turning people away at the door. I know they weren’t lining up to see me, but even so. I was third on stage out of nine “acts”, the last before the first interval. This was a good slot, the friendly organisers said, because it meant I could relax and enjoy the rest of the evening. Strangely, I felt no nerves at all when my time came. Up on stage, I couldn’t see a thing – the spotlights were so bright. But there was a big audience out there somewhere. And they were waiting for me to entertain them. I only realised afterwards – or maybe not until the evening itself – what a risk the organisers were taking when they decided to give me a slot. They must have liked my story, but they’d never heard me read to an audience. I could have been a disaster. Luckily, I wasn’t. It went better than I could possibly have hoped. People were really kind afterwards – audience members and other performers. One, who’s act I really enjoyed, said “you’ve got ‘It’”; the organisers said I was “amazing”. Anyway, I’m hooked on live performance now and will be looking for any chance to get on stage again. So watch this space. Just a shame I didn’t get any photos. I made another small piece of “LiveLit” yesterday, inspired by last weekend’s workshop. This is based on a story idea I had knocking around but, unlike my last effort, I was writing the words with the images in mind this time. Only one of the images that I was thinking of actually made it into the finished piece, but it was interesting playing with them nonetheless. The original idea used a lot of covers from 1970s knitting patterns, I had great fun researching those. I want to do more of these, taking inspiration from writer Sarah Salway, who regularly posts 50-word photo stories on her blog. I met her briefly at an exhibition she has contributed to at the Tubridge Wells museum – writing words suggested by an item from their archive, and turning them into something people can look at, touch and play around with, rather than just read or listen to. Very much in the LiveLit spirit! Well worth a visit. My kids loved it, too. I’m thinking of 100-word film stories, rather than 50-word photos. The original draft of the “West of Aran” piece was 170 words or so; the final version about 90. Cutting it down was a useful discipline; if I wasn’t making the film I would have left it as it was. I prefer the short version. Listening to it again, I can hear changes that I would make, parts that don’t work as well as they might. But in the spirit of LiveLit, here it is – make of it what you will! “West of Aran” by the way, is the name of a buoy that captures meteorological information. It’s off away in the Irish sea, somewhere west of Aran. Even in February, London can be very colourful, if you look up. I went to an amazing workshop in Folkestone yesterday. The idea was to explore new ways of presenting literature to an audience. It was massively inspiring, and I put some of what I learned into practice today. I put together the little “film” here in about 45 minutes. The audio was recorded into a dictaphone, in the bathroom, with a towel over my head. My voice sounds pretty rough and shaky, but that’s because I’d only been awake for a few minutes. Normally I’d try to get this perfect before posting, or just throw it away. But in the “just do it” ethic of yesterday, I’m putting it here as it is. I learnt a lot from doing this, and from yesterday. I’ll post more about that later. Posted byneilsbaker January 30, 2011 Posted inUncategorized2 Comments on Experimenting with "Live Lit"
I’ve read a lot of personal essays, and read a lot about them, but I’m not sure I’ve ever written one. I say ‘not sure’ because I’ve maybe written quite a few in notebooks, or written words that could be turned into an essay, but have never tried to actually produce one that might be published. I’d like to try that, and have been thinking about giving it a go this year. One obstacle is voice: Who is writing the essay? Is it me, or some kind of essay-writing version of me? And is it a voice that speaks the truth, or a version of it? The full interview is worth reading, especially for what he says about Montaigne, which I think I disagree with. Because I spend so much time on my own, at my desk, writing, with nobody else in the house apart from the dog, people often ask me whether I get lonely. I don’t, usually. I bought someone a Kindle for Christmas, or contributed my share of the cost. A useful gadget, but I prefer to have all my books where I can see them, on the shelf. 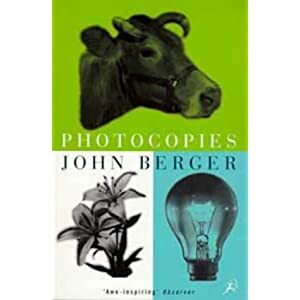 I was looking at one of those shelves late last night, from the comfort of my chair, and pulled down a copy of Photocopies, by John Berger. This is a stunning book, which I bought some 15 years ago and have read many times. It blurs the lines between fiction and non-fiction, and, importantly, always inspires me to write. Berger is English, but left this country to live in France four decades ago. Why? He gives a fascinating answer in the interview below. He never felt at home in England, he says. Whenever he talked to people or listened to them, he felt he embarrassed them. “I was indecently intense,” he says. Yesterday was my first day back at work. Over the holidays, as usual, I spent a lot of time thinking about how to balance my working day, how to mix my different responsibilities. The aim, as always, is to find more time to write. Because if I had more time to write….ah, well. How much money does it take to be happy? Ask anyone that question and they’ll usually answer with a figure that is just a little bit more than they earn now. The amount of money they need is always just out of reach. A Boxing Day walk through the frozen pear orchards. Blocked up like a bank holiday motorway? Devoid of any writing ideas? Here’s my Five Step Short Story Idea Generating Process (TM pending). Take a blank sheet of paper and make a random list of characters and their objectives. For example: A man who desperately needs £100,000 within a week; a woman who must get her head unstuck from some railings; a man who wants to be young again; a girl who wants to buy a second-hand caravan. Make a random list of scenarios: The world will certainly end next Thursday; walking is made illegal; all the bees die; dogs rule the world. Make a list of interesting words: Treachery, lust, envy, arrogance, porridge, goats, pasta, secrets. Choose one and get writing. Easy. How hard is it to write? Writing can sometimes be very difficult. How’s that for an understatement? But how hard, or easy, is it meant to be?